Minime (via Lifehacker) is an AutoIt application that can be used to put any open window - be it program or folder - into the Windows System Tray. While that is not really something new it comes with a feature that might be interesting to users who run many applications and folders. Minime bundles the minimized windows into one System Tray icon. If you are the type of user who usually has dozens of icons in the Windows System Tray then you might want to consider switching from your favorite Tray Minimizer application to Minime. While running Minime in the background users can make use of the keyboard shortcut [CTRL Shift Z] to minimize the active window to the System Tray. 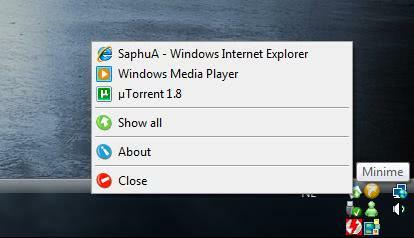 Windows can be reactivated by either choosing a single window or by selecting the Show All option. Users are reporting problems with 64-bit editions of Windows Vista. Other editions and Windows operating systems should run fine. Minime uses about 6 Megabytes of computer memory when running in the background. I use TrayIt to minimize windows (Remote Desktop for example) to the systray, but the grouping feature obviously makes Minime better.